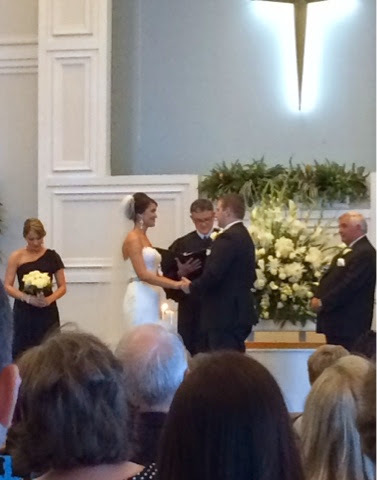 Ferg Family Adventures: Adam and Erica's Wedding! 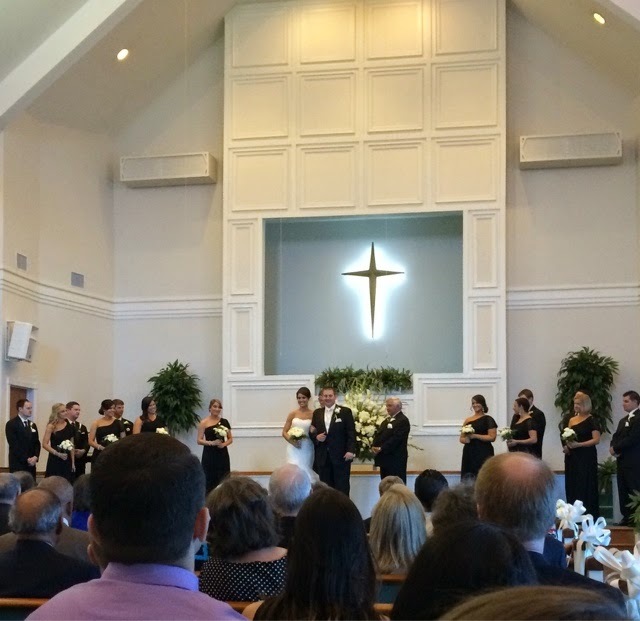 This past weekend, we attended the wedding of Travis' friend, Adam and his lovely wife Erica! 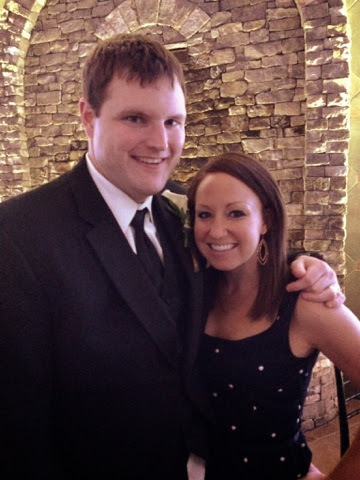 Since Trav was in the wedding, I rode to the church with Amanda, whose husband was in the wedding as well. There was terrible traffic, so we got there at 3:59...and the wedding was at 4. Whoops! The ceremony was gorgeous and was in Erica's home church. 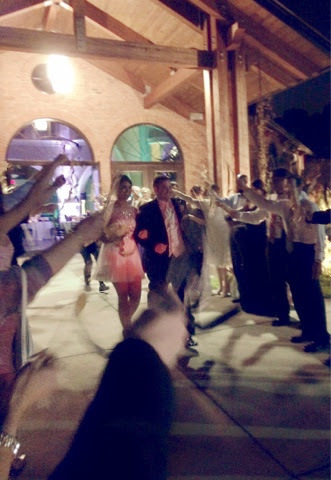 The reception was about 50 minutes (!!!!) away, so Amanda and I decided we would both pump...in the car....on our way to the reception. It was quite a spectacle. 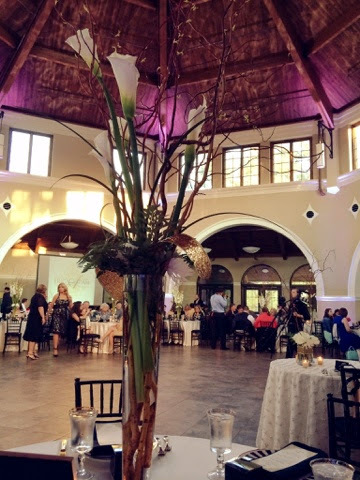 The reception was at Cape Fear Botanical Garden, which was gorgeous and had lots of pretty areas for picture taking! Unfortunately, I didn't get a good pic with my husband till later, because he had to stay with the wedding party during the cocktail hour. 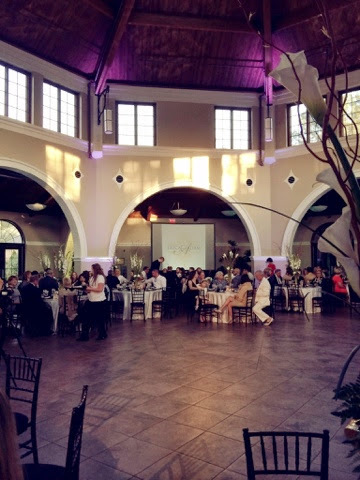 The room was super big and open and had gorgeous purple and green uplighting once the sun set! Our meal was served family style, which could have been a little awkward if we didn't know everyone at our table, but fortunately, we were sitting with all good friends. The food was really good...we had trout, chicken and a filet! 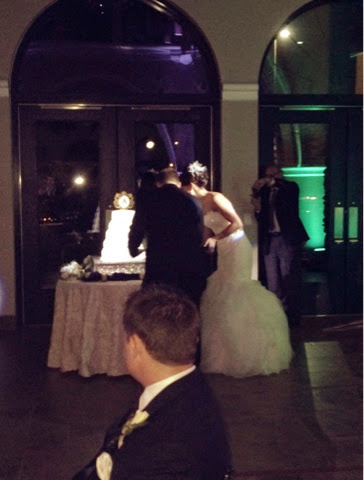 Their cake was super gorge and I'm still kicking myself for not getting a good enough pic of it...it had lights shining on it to make it look even more pristine (Trav thought it was an ice sculpture, haha)! 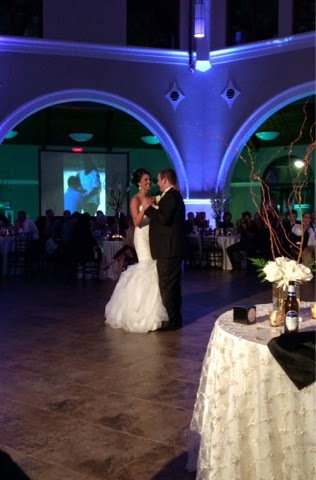 I actually had to leave soon after the first dance (during the daddy/daughter and mother/son dances) because I was about to cry thinking about Travis dancing with Ella at her wedding one day. I hid in the bathroom for about 10 minutes and I pulled myself together. For their exit, Erica changed into a shorter, super cute, sparkly dress!! I wish I had gotten a better picture of it! 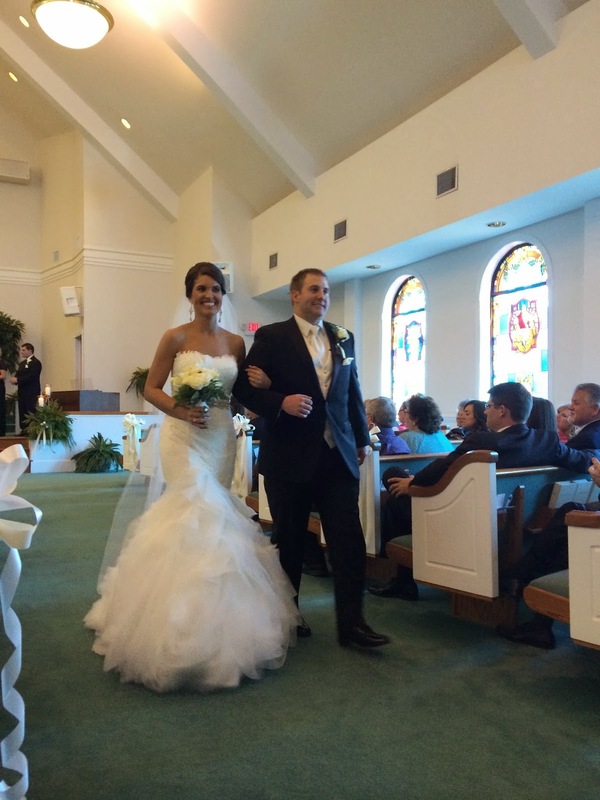 Congrats, Adam and Erica!!! Have fun in Fiji!!! Pretty and you look great!! Reception 50-minutes away????? Why do people do that? I don't know, I guess having gotten married at a more mature age I thought more about my guests then ourselves. We did everything in one place. Oooh, I love her dress! 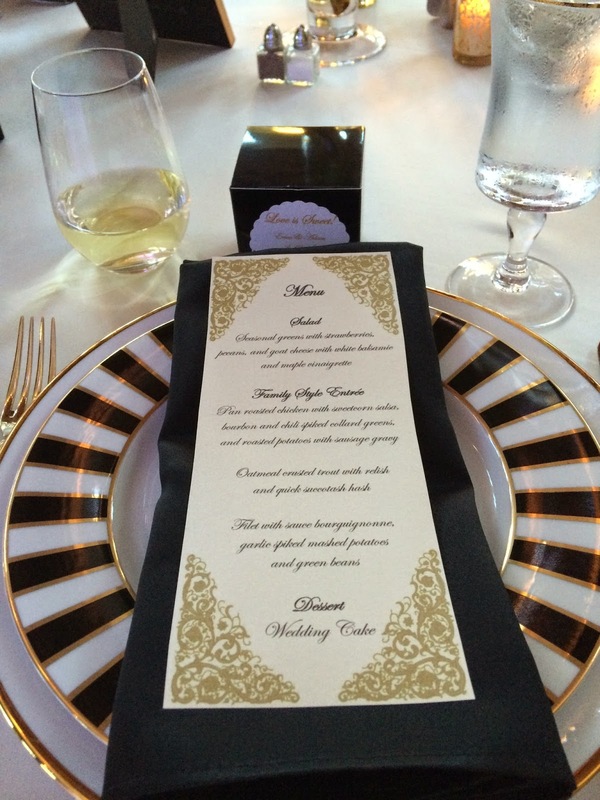 And the place settings!